Derrick Bell, a legal scholar who worked to expose the persistence of racism in America through his books and articles and his provocative career moves — he gave up a Harvard Law School professorship to protest the school’s hiring practices — died on Wednesday in New York. He was 80. 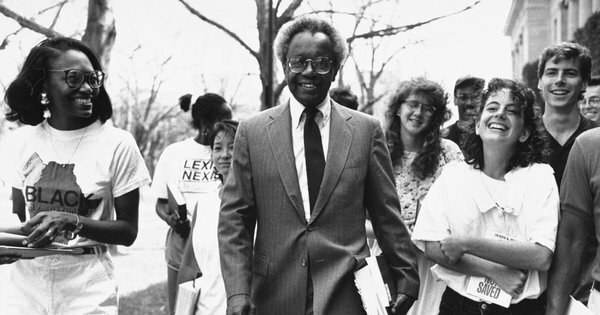 Mr. Bell was the first tenured black professor at Harvard Law School and later the first black dean of a law school that is not historically black. But he was perhaps better known for resigning from prestigious jobs than for accepting them. In his 20s, while working at the Civil Rights Division of the Justice Department, he was told to give up his membership in the N.A.A.C.P., which his superiors believed posed a conflict of interest. Instead, he quit the Justice Department, ignoring the advice of friends to try to change things from within. Mr. Bell, soft-spoken and erudite, wrote that he was “not confrontational by nature.” But he attacked both conservative and liberal beliefs. In 1992, he told The New York Times that black Americans were worse off and more subjugated than at any time since slavery. And he wrote that in light of the consequences of the Supreme Court’s 1954 desegregation decision, Brown v. Board of Education, things might have worked out better if the court had instead ordered governments to provide both races with truly equivalent schools. He was a pioneer of critical race theory — a body of legal scholarship that explored how racism is embedded in laws and legal institutions, even those intended to lessen the effects of past injustice. Mr. Bell “set the agenda in many ways for scholarship on race in the academy, not just the legal academy,” said Lani Guinier, the first black woman hired to join the Harvard Law School’s tenured faculty, in an interview on Wednesday. At a rally while a student at Harvard Law School, Barack Obama compared Professor Bell to the civil rights hero Rosa Parks. Mr. Bell’s core beliefs included what he called “the interest convergence dilemma” — the idea that whites would not support efforts to improve the position of blacks unless it was in their interest. Asked how the status of blacks could be improved, Mr. Bell said he generally supported civil rights litigation, but cautioned that even favorable rulings were likely to yield disappointing results and that it was best to be prepared for that. Much of Mr. Bell’s scholarship rejected dry legal analysis in favor of allegorical stories. In books and law review articles, he presented parables about race relations, then debated their meaning with a fictional alter ego, a black professor named Geneva Crenshaw, who forced him to confront the truth about the persistence of racism in America. When I first read FACES AT THE BOTTOM OF THE WELL, the book that contained the SPACE TRADERS story, I woke up the next day wanting to do a multi-ethnic version of THE TWILIGHT ZONE. HBO bought it under the name SOCIAL FRICTION FABLES and I attached well-known black extraterrestrial George Clinton as host. Novelist and good friend Trey Ellis wrote a brilliant adaptation of Bell’s original story; Robert Guillaume starred in the lead role of Gleason Golightly, the black advisor of the Republican president. The other two segments of the trilogy included an adaption of a Chester Himes story written by Kyle Baker and directed by Kevin Sullivan, starring Chi McBride and Paula Jai Parker; and a Santeria based mystery written and directed by my brother Warrington and starring Nicholas Turturro. When the finished show was shown internally among executives at HBO, there a lot of drama that we eventually caught wind of. Apparently the black executives at HBO thought the show was “dangerous” because seeing the Space Trader segment would “give white people ideas”, as if they didn’t come up with the Trans Atlantic Slave Trade, Jewish Concentration Camps and the massacre of Native Americans already. The pedigree of legendary Harvard Law professor working with a Stanford-trained novelist and the Harvard -trained director of HOUSE PARTY and BOOMERANG, all black, wasn’t enough for them to consider the idea that we might know more than them. I’m sure their heart was in the right place, but their political sophistication was primitive, as is often the cast with Plantation Negroes, as blogger Denmark Vesey calls them. This lack of game is ironically exactly what the story is about. The black executives lobbied hard to get HBO to dump the show altogether. They failed at that but they did get the marketing budget severely cut. The show didn’t get a big push, but we got decent numbers and ended up winning two Cable Ace Awards for best special and best actress for Paula Jai Parker, who beat out an amazing list of major white actresses. It’s such a drag to win an award that doesn’t exist any more. It was a big deal at the time! I constantly get correspondence from professors who use the film in their college courses. When I first met Quentin Tarantino, the conversation began with him chastising me for only doing a short film when it deserved the big screen treatment. The film was released on VHS and Laserdisc, but it’s still not on DVD. I didn’t upload those segments on YouTube, but in honor of Dr. Bell’s passing, I wanted to post the show on the site. In his honor, read his books so we may elevate our game from checkers to chess.